Security Groups are the first layer of defense for EC2 instances (AWS documentation), and control both inbound and outbound traffic at the instance level. AWS Scout2 has a default ruleset that reports known sensitive ports that are open to the Internet (in the following screenshot, 22/SSH). 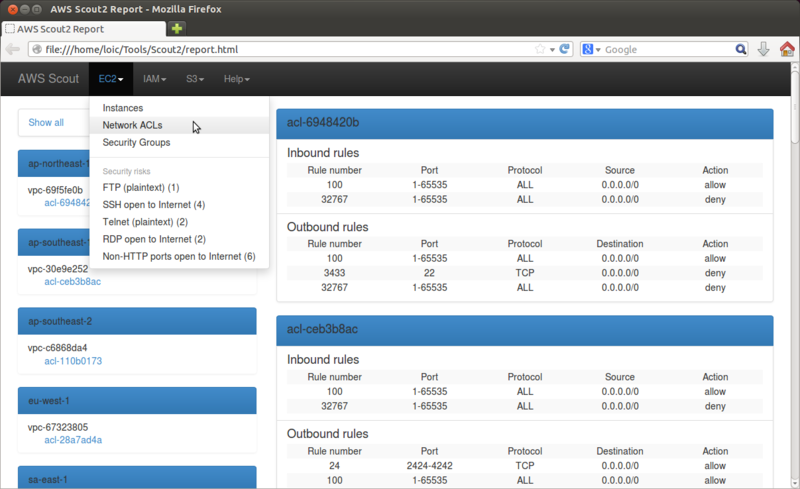 Additionally, the default ruleset also reports open ports whose number are associated with plaintext protocol (in the following screenshot, 23/Telnet). 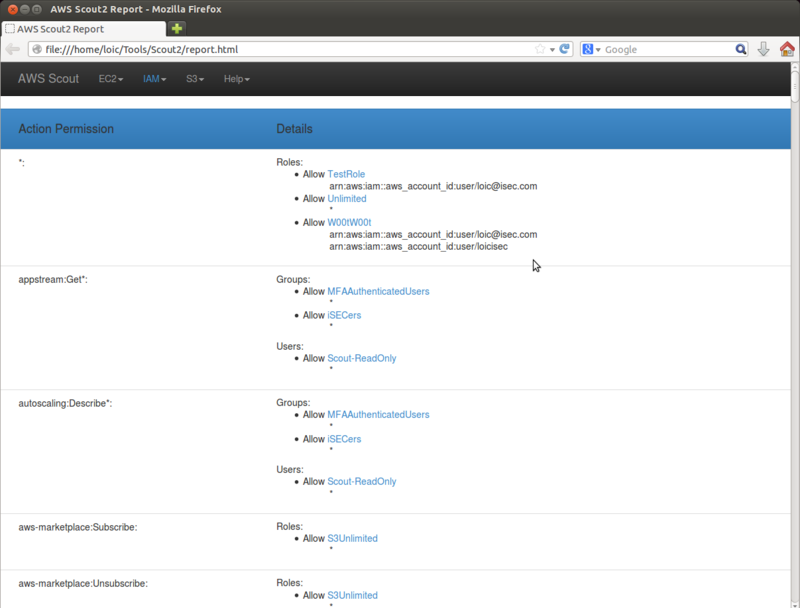 The IAM tab in the HTML report allows to review IAM users, groups and roles. In the following screenshot, AWS Scout2 reports two dangerous findings (lack of Multi-Factor Authentication, lack of access-key rotation), and warns about a third one (support for two types of authentication). 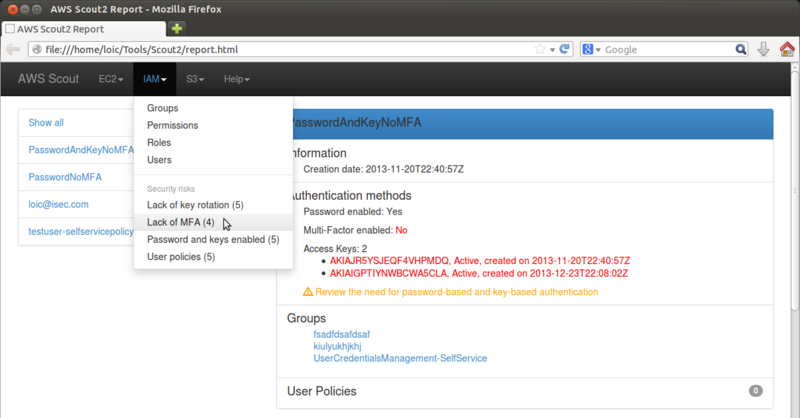 When reviewing IAM users' settings, you can access details about IAM groups they belong to by clicking on the name of the group. 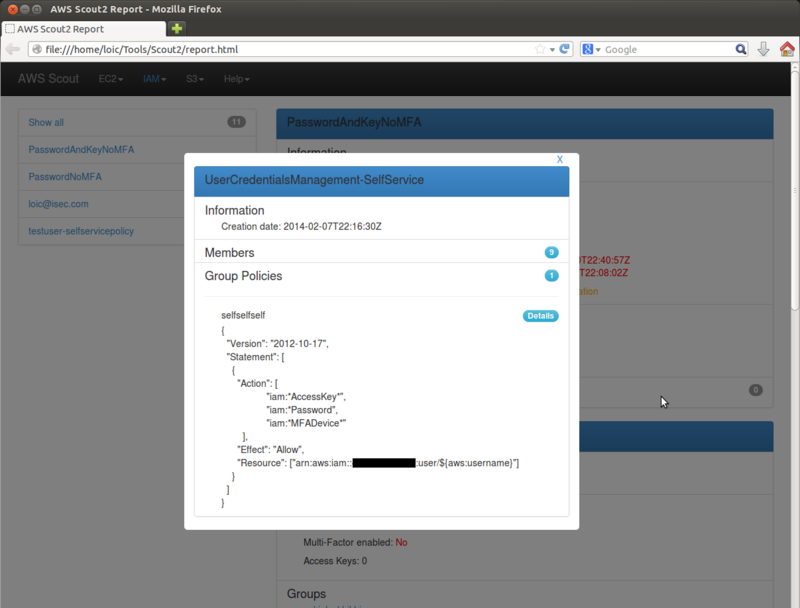 This will overlay the IAM group details, including policies and other members. The IAM view also offers a permission summary that lists all permissions that are granted, or denied, throughout the AWS account policies. For each permission, a list of IAM users, groups and roles is provided, along with the resources accessible to each of them. 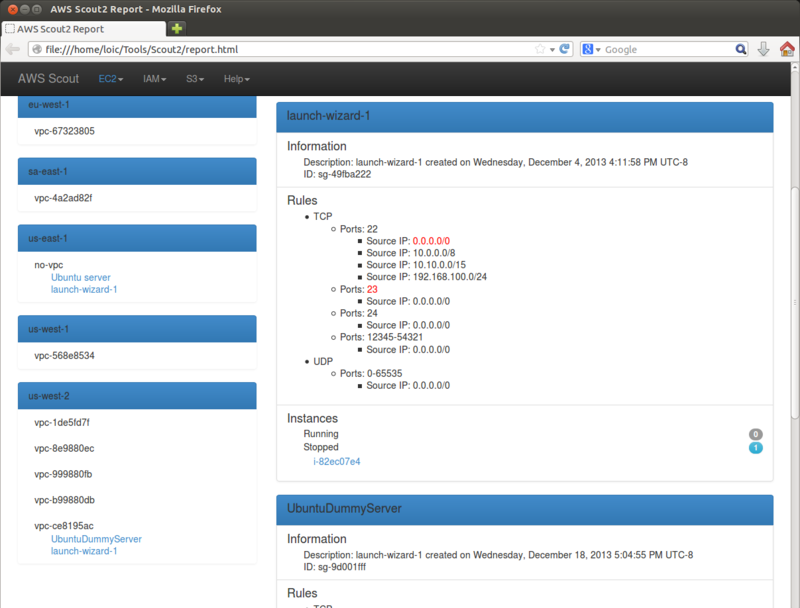 AWS Scout2 fetches the S3 configuration as well. The default ruleset highlights buckets that are world-writable, and whose permissions are world-writable. Additionally, a warning is displayed for world-readable buckets. Open the default ruleset you wish to enhance, and create a new entry. Define and implement the new callback in the corresponding utils file. Update the report.html to highlight thew new finding. The following code snippets illustrate the addition of a new rule. In this example, the new rule warns against the use of user policies (this rule is now part of the default ruleset).